Boat Azimut 36 called Nemo SJ has been built in 1997. We propose this vessel from harbor Primošten in the region close to Sibenik. Nemo SJ is licensed for 4 pax. Layout of the sailboat is 4 +2. Azimut 36 Nemo SJ is equipped with 2 cabins. For guests disposal there are 2 WC. You can fill the diesel tank with 1000.00 l liters and in water tank it goes even 450.00 l liters. With motor 2 x 370 PS CAT 3116 - 370 HP Nemo SJ can navigate really fast. Nemo SJ is 11.68 m long and 3.96 meters wide. Draft is 1.00 meters. 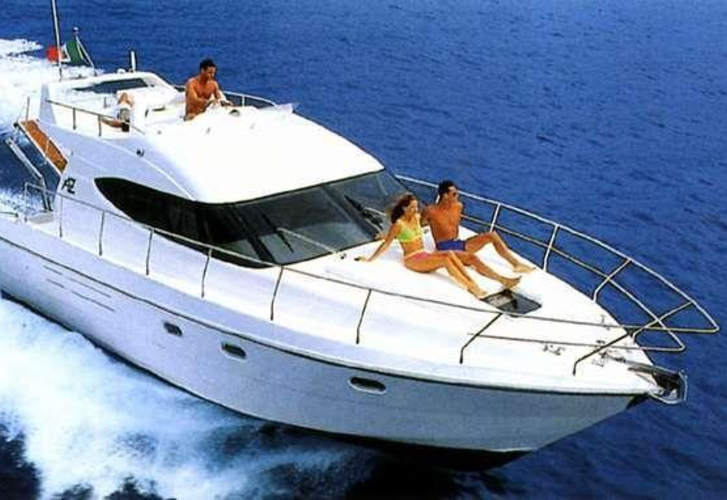 Use our website to find more offers by opening this link: Motorboats Primošten. Boat's equipment consists of : Anchor electric windlass, Hydraulic gangway / dighy crane, Outboard engine, Autopilot, Bow thruster, Gps plotter, Air conditioning, Wc pump electrical, Flybridge, generator, Internet Wi-Fi, TV, DVD player, TV. . Deposit has value 3000.00 EUR. Choose our offer and enjoy your vacation on the deck of Nemo SJ. This Azimut 36 from Primošten from Croatia You can find right here: Motorboats Croatia.